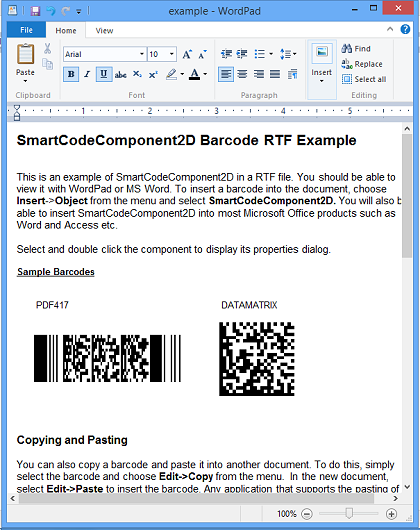 SmartCodeComponent2D lets you add professional quality 2 dimensional barcodes to documents like those from Word and Excel. It exposes a full range of barcode properties and allows precise control over the barcode dimensions. SmartCodeComponent2D lets you add professional quality 2 dimensional bar codes to documents like those from Word and Excel. It is extremely powerful, utilizing the same engine as SmartCodeStudio, the industry leading and award-winning label design / barcode software. SmartCodeComponent2D will work flawlessly with any Windows application that supports OLE (Object Linking and Embedding) Server and ActiveX Controls. This includes most (if not all) Microsoft Office products, WordPad and many third-party softwares. SmartCodeComponent2D exposes a full range of barcode properties and allows precise control over barcode dimensions. Data validation is also carried out over all input to ensure the generated barcode meet industry specifications. Supported symbologies include DATAMATRIX, PDF417, QR and Micro QR. This upgrade improves the user interface with a new Ribbon for the MetaFile Creator. Web based multi warehouse inventory system integrated with online store.This system allows your personal and customers to see the data they need in real time anywhere. All they need is an internet connection. All the features you need to produce labels with fixed or dynamic text, pictures & barcodes. Its powerful desktop publishing tools let you create labels for compliance labeling, inventory, shipping or barcodes for any auto ID or tracking application. Barcode ASP.NET WEB Control lets you add barcodes to your ASP.NET web application in ten minutes without having to write complicated code. BarCode ASP.NET Web Control has been designed specially for the use in ASP.NET web applications. Barcode Alpha is powerful, easy-to-use labeling software with WYSIWYG label design interface. It supports all major types of barcode symbologies (EAN13, UPCA/UPCE, Code128 Code39, Bookland, I2of5, Code93?others). Designed for UNIX, Linux. Barcode Alpha is powerful, easy-to-use labeling software with WYSIWYG label design interface. It supports all major types of barcode symbologies (EAN13, UPCA/UPCE, Code128 Code39, Bookland, I2of5, Code93?others). Designed for Mac OS X.
ConnectCode Barcode Software and Fonts is a True Type and Open Type barcode fonts package designed for use in modern operating systems. It allows the creation of different types of barcodes by simply selecting a font in the text editor. This site does not contain serial number, crack, keygen SmartCodeComponent2D Barcode serial number : serial number is the simplest type of crack. A serial number(cdkey,product key,etc) is register the program as you may already know. a crack or keygen may contain harmful software. If you cannot find the exact version you want, just give it a try. for more information read .nfo/.txt/.diz file include in zipped file.